Maito Komuro makes magic. That’s how it seems, just like when someone first showed you photographic developing, a sort of wizardry. 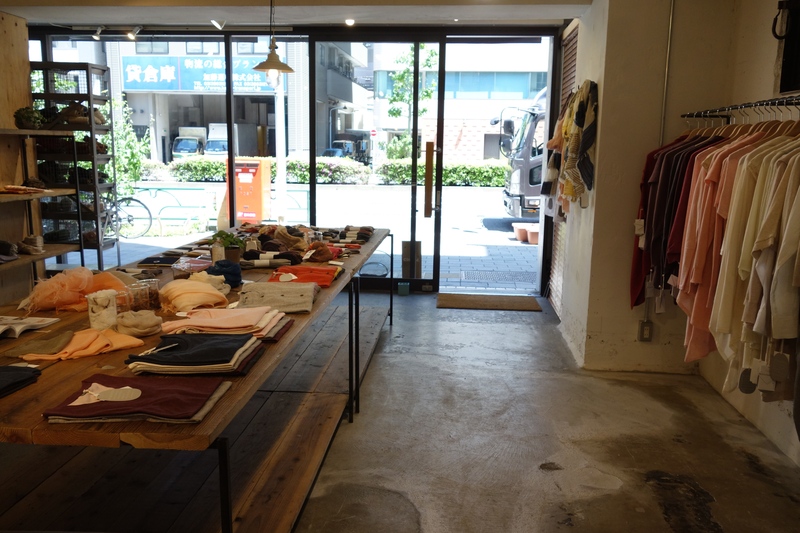 See, in this plastic bucket, in the workshop behind the showroom of his self-named store in Kuramae, behind his hanging racks and shelves of delicate natural-fibre clothes, see this purpleish blackish liquid. And here in this collander are some green branches he has boiled. It’s yomogi, he says, mugwort. And here is what happens – he unfolds a length of summery lemon-coloured cotton, which is what you get when you put white fabric in the blackish purple liquid, and then set it with a mineral – a mordant – such as calcium, copper, iron, or aluminium. He shows you some different coloured cottons, including a driftwood sort of beige, and bright yellow. All of them from the same purple mugwort solution, just with different mordants. I was wondering when I was at college what I could make, because dyeing is a process, rather than something tangible. Tree roots, sakura cherry blossom, cochineal bugs, sap, a sort of pine cone, cloves, indigo and other materials all colour his clothes. The tones are close to pastel, but there is variety and depth within single colours. Original buttons are cut from palm seeds by a local craftsman. 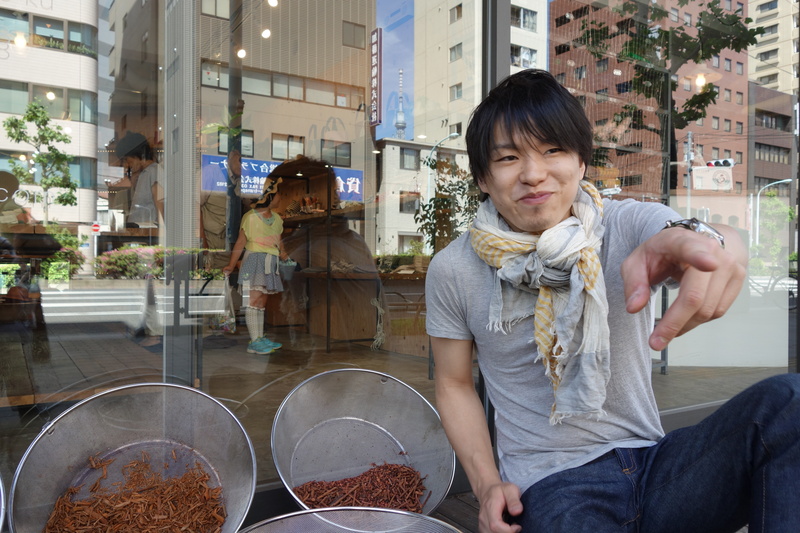 Maito dyes much of his thread in Kyushu, where his father runs a natural dye company. His father, and father’s fathers, were kimono textile weavers in Kyoto. I was wondering when I was at college what I could make, because dyeing is a process, rather than something tangible, he says. He graduated in textiles in 2004 from Tokyo Geidai – the University of Fine Arts. He took a night-time degree at the same time at Shinjuku’s Bunka Fukusou Gakuin, Bunka Fashion College. You wonder how he did it, as both institutions are recognised as the country’s best and most demanding. For the time being, he designs and makes his own women’s range. Also hats and bags – collaborations with leather crafters. Maybe a men’s wardrobe next year, although he already does good linen socks and scarves. He also wants to make his own thread, to weave fabric. It takes a year to set yourself up to make thread, he says. He owns three large knitting looms in Osaka and leases another seven in collaboration with local knitters. It’s not his choice to be spread around the country like this. He says, Knitting requires many finishing processes and you need people on hand, and the best ones are in Osaka. You envy his students. He puts you at ease, and his extreme busyness seems natural, because you can tell he also has patience. He is looking at setting up the machines in Tokyo. Maybe somewhere along the river – Kuramae, if it wasn’t getting more expensive. He says, There are many graduates of Bunka Fukusou who would like to run knitting machines. Employing other graduates would also contribute to the craft, and he is keen to pass on knowledge. 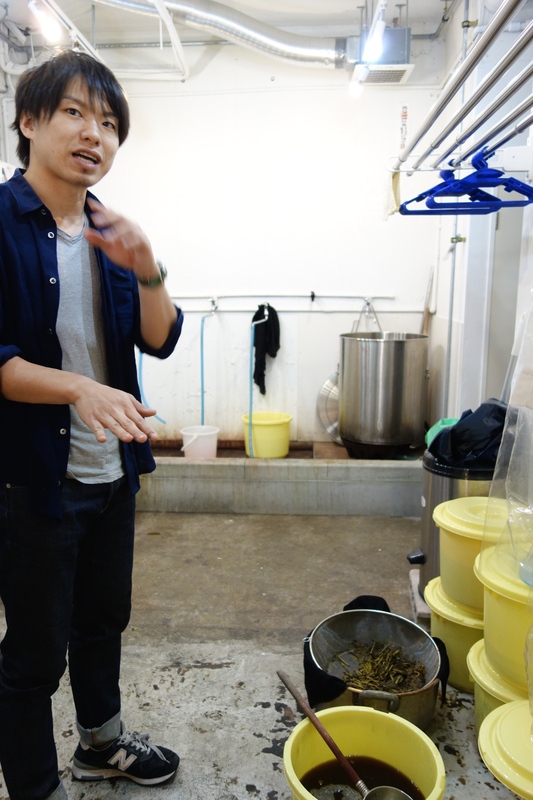 He runs free dyeing workshops every month as part of the Kuramae First Saturday event. He began lecturing at Geidai this month. I’m a good teacher, he says. You envy his students. He puts you at ease, and his extreme busyness seems natural, because you can tell he also has patience – he has the space to be busy. And possibly the time – he is just 32. It’s tempting to draw a parallel with his huge smile, as if this capacity for expression and laughter feeds a hunger to grab life.